Three classic Kartemquin documentaries from 1974 probing issues of gentrification, race, youth, and poverty in the Chicago neighborhoods of Wicker Park, Pilsen, and Gage Park, will be showcased at 2pm on Saturday, March 12th at the Chicago Cultural Center’s Claudia Cassidy Theater. The free film screening and discussion, hosted by WTTW and the City of Chicago’s Department of Cultural Affairs and Special Events, is part of a year-long celebration honoring the 50th anniversary of Kartemquin Films and the upcoming DVD release of The Kartemquin Collection Volume 4: The Collective Years. The screening will consist of Now We Live on Clifton, Winnie Wright, Age 11, and Viva La Causa, three short documentaries originally made during a period in the 1970s when Kartemquin organized as a left-wing collective, employing a collaborative model of filmmaking that blended artistry with activism, sharing 16mm films through grassroots distribution networks. Original members of the Kartemquin Collective will be in attendance, including Peter Kuttner, Suzanne Davenport, and Sharon Karp, along with film participants Winnie Such (star of Winnie Wright, Age 11), Pam Taylor (star of Now We Live on Clifton), and Chicago community art expert, Giselle Mercier. The discussion will be moderated by WTTW Senior Producer, Dan Andries. RSVP for the free screening: http://bit.ly/ktqcollective. The Kartemquin Collection, Volume 4: The Collective Years DVD Trailer from Kartemquin Films on Vimeo. 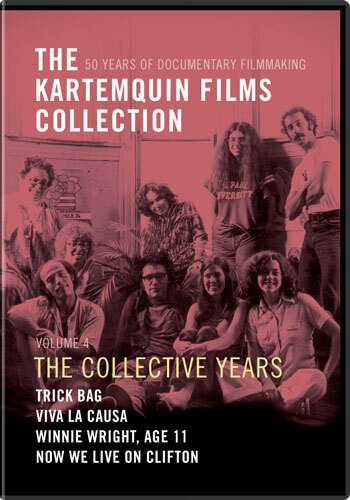 The DVD release of The Kartemquin Collection Volume 4: The Collective Years features the three films along with Trick Bag (1974), in which gang members, Vietnam vets, and young factory workers from Chicago's neighborhoods tell of their personal experience with racism. All four films are released on DVD for the first time, in digitization of original 16mm prints newly restored through a grant from the National Film Preservation Fund. Use coupon code: KTQvol4 for 25% off before March 15 when you purchase at the Kartemquin store. In Now We Live on Clifton (1974) the filmmakers follow 10-year-old Pam Taylor and her 12 year old brother Scott around their multiracial West Lincoln Park neighborhood in Chicago. The kids worry that they'll be forced out of the neighborhood they grew up in by the gentrification following the expansion of DePaul University. This film was created by members of the Kartemquin collective, with credits shared between Jerry Blumenthal, Alphonse Blumenthal, Susan Delson, Sharon Karp, Peter Kuttner, Gordon Quinn, and Richard Schmiechen. Winnie Wright, Age 11 (1974) follows Winnie, the daughter of a steelworker and a teacher, who is living in Gage Park, a Chicago neighborhood that is changing from white to black. Her family struggles with racism, inflation and a threatened strike, as Winnie learns what it means to grow up white, working class, and female. Winnie Wright, Age 11 was created by Kartemquin collective members Suzanne Davenport, Greg Grieco, Betsy Martens, Gordon Quinn, Teena Weeb, Jerry Blumenthal, Sue Delson, Sharon Karp, Peter Kuttner, Mike McLoughlin, and Richard Schmiechen. In Trick Bag (1974), gang members, Vietnam vets, and young factory workers from Chicago's neighborhoods tell of their personal experience with racism. The film was brought to Kartemquin by Peter Kuttner, and credits are shared between Kartemquin, Rising Up Angry, and Columbia College Chicago. Viva La Causa (1974) is a colorful record of the making of a mural in Chicago's Pilsen community by Ray Patlán, this film traces the mural movement of the mid-1970's back to murals in Mexico. Directed and produced by Teena Webb. Extra features on the DVD include a new video of a rare reunion of the the living collective members, new videos of Winnie Wright and Pam and Roxanne Taylor reflecting upon their experience of being in the films; and several archival photos and documents from the era, along with a 'Where are they now?' update on the Kartemquin collective. WTTW is honoring Kartemquin’s 50th Anniversary with a series of monthly broadcasts through 2016 that features films from each decade of their history, including the classic Hoop Dreams (1994), which will air in June 2016, to coincide with a Kartemquin “Milestones” gala celebration at the Harris Theater on June 24, and an exhibition of Kartemquin’s archival materials running May-August at Expo 72 gallery. Other films in the WTTW monthly broadcast series include Golub: Late Works are the Catastrophes (2004), a searing portrait of controversial political painter Leon Golub, airing in April; the devastating Prisoner of Her Past (2009), in which Chicago Tribune journalist Howard Reich investigates a secret childhood trauma resurfacing, sixty years later, to unravel the life of his Holocaust survivor mother, airing in May; and the broadcast premiere of the award-winning Almost There (2015), about two filmmakers’ complicated relationship with a reclusive outsider artist, airing in July. Find out more about all our 50th Anniversary events at www.kartemquin.com/ktq50.